This set of photos was taken on May 7, 2017 starting at 11:35 AM. The "Take It!" 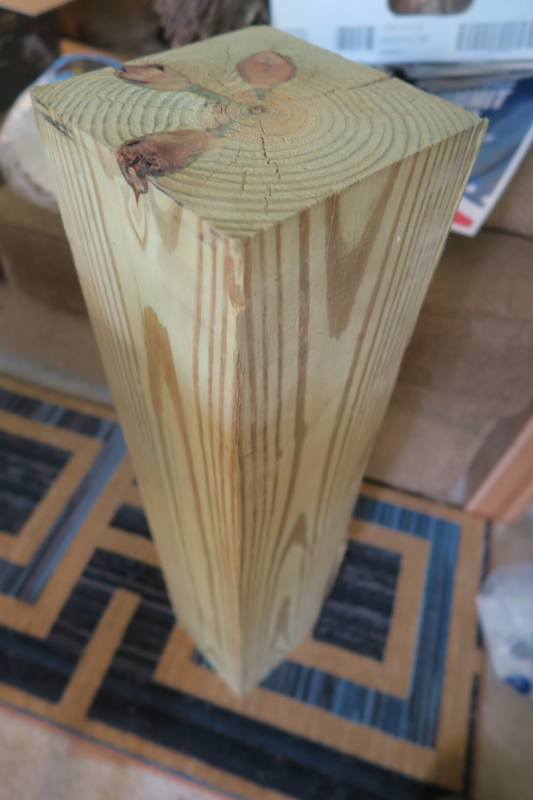 came after having picked up this end piece of pressure treated 6 X 6 fence post. It was from a job that was a replacement of a fence that had blown down in a wind storm that was a partial partition around a commercial site. I noted from the lumber left from the tear down that it had been originally put up using 4 X 4 's as posts. The original had been in place for many years - to the point that there was decay in the old post. When it blew down - it must have caused quite a ruckus as it was a long fence. I am always watching for scraps and bits of things as am usually able to use them in some sort of project. This was a fairly fresh find and had not been put away nor found a use. 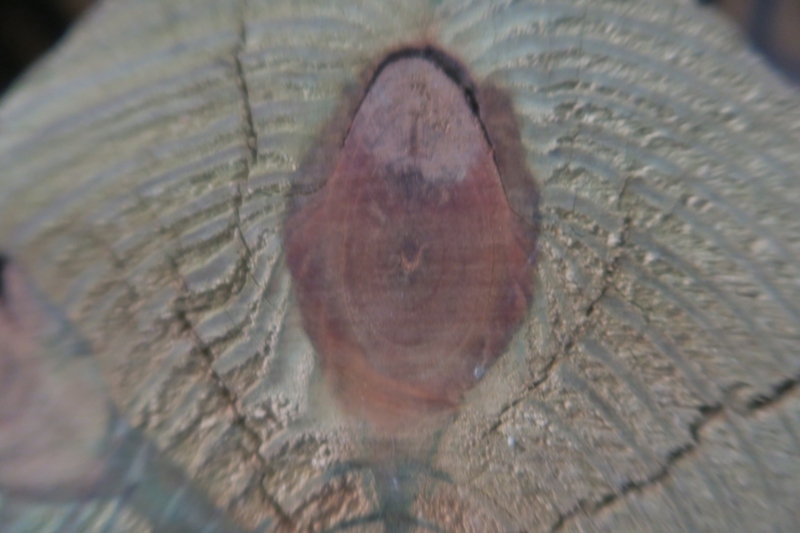 So it was in my living room minding its own business, and I for some reason after looking at it over time happened to walk by it and saw the comparison of a tree branch encased in the depth of the wood that in the cross cut of the post, had exposed an oval in the dark wood that took on the shape of a thumb print. 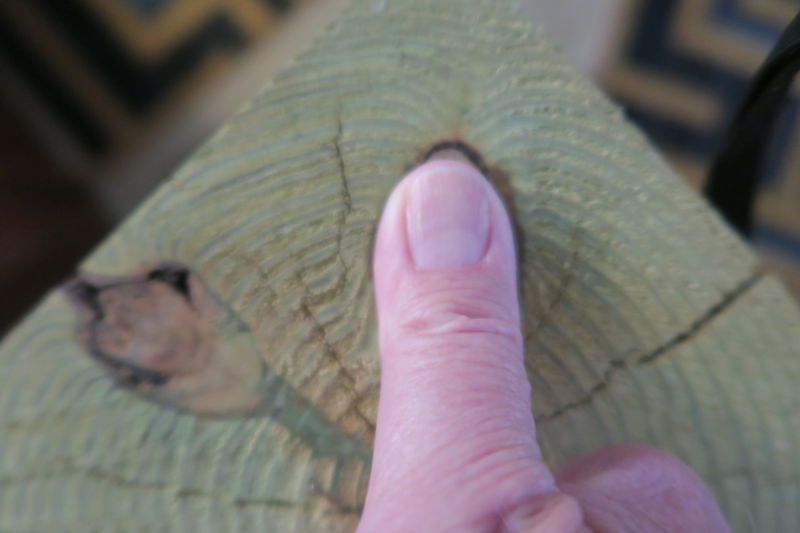 The age rings in the dark wood even had an almost erie way of being comparable to the rings in my thumb print. The After Take: I showed this to a few of my picture review friends who by now know of my having an active imagination. They all thought it was cool and the comparison quite out of the ordinary. I could only agree with them, and voiced my usual disclaimer of not knowing why it had come to me, just that I am grateful to be able to see some of these kinds of offerings. This was one of those - took a while - to be able to put it into words. 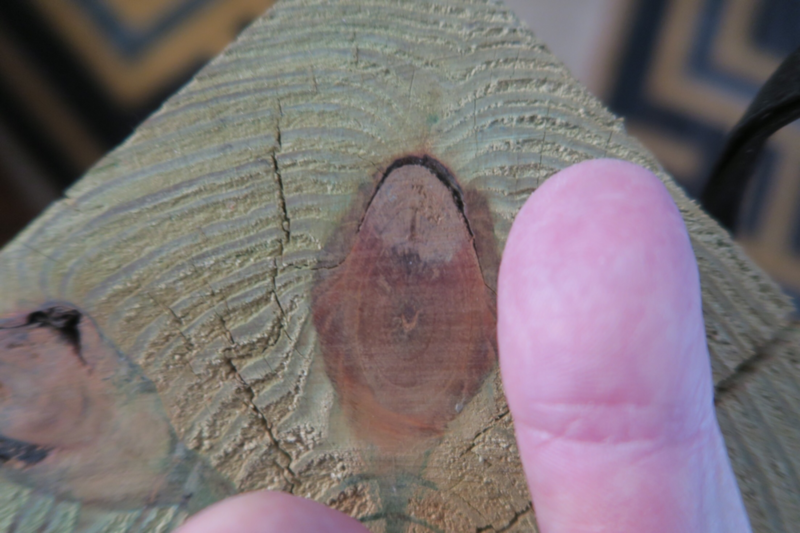 PS: I am going to take my palm sander to this to see if I can sharpen the cut a bit and bring out the rings with more clarity. I am contemplating making up a wall for displaying this growing collection of wonders. Almost a perfect thumb print. I think its safe to assume you've taken up some form of carpentry or woodwork? Good on ya! Lol our youngest asked how you did that with your thumb, too cute. Even something as simple as a 4x4 can present its own beauty.